Conversation Agent - Valeria Maltoni - Can Poetry Matter? How could it not? 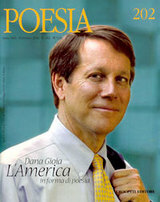 Yesterday I met Dana Gioia, Chairman for the National Endowment for the Arts. And indeed it was a joy to be sitting among the audience at the Wharton Leadership forum and letting his verse enchant me along with 300 people. If anyone can tell a story with a poem it is Gioia. The purpose of art is to bring people together, he said. Gioia sees the arts as an ecosystem that helps bring love into the conversation. If you follow the link above and read his biography, you will be impressed. He received a BA and an MBA from Stanford University and an MA in Comparative Literature from Harvard University. He also worked for 15 years in the corporate world, eventually becoming President of General Foods. I must admit that the most endearing attribute to me is that he is of Italian and Mexican descent and can not only speak, but also translate from Italian, Latin, German and Romanian. He translated Eugenio Montale's Mottetti: Poems on Love (1990), probably my favorite Italian poet. We often hear about the science part of marketing, we forget the art part. Yet if we do want to forge a deep emotional connection with the people we serve, if our desire is to listen to what people are saying, if we want to dance in the reinvention of this often pragmatic and 'just do it' business environment -- we would be smart to raise our daily actions into the realm of artistic excellence. My friend Constance Goodwin calls this Leadership as a Performing Art(R). Montale, who received a Nobel-Prize for literature in 1975, wrote about a man's place -- and displacement -- in the natural world, about remembrance and loss, and about love. The strength of his poetry is direct, intuitive, forceful existential provocation, obtained with dry synthesis, with words and verses distilled to stern minimal syllables and signs: situations, feelings, fears and concepts precisely evoked with three, four words, two, three verses. behind me -- with a drunkard's terror. We should not try to read too much into it, I learned. It is easier to listen, to feel, and to understand. The poet's obscurity is the reader's liberty. Do you sense the hopeless yearning to relate our life to the life of the universe? The intuition that nothing could be at our shoulders? It is this intuition that produces his affectionate embrace of life, his careful attention to the small daily details and the burden of going with our secret, among people who don't look back. We spent some time this week discussing a logo as art. Artistic excellence is an attitude, the availability to life, to the things we find important. We never know how long we have. Gioia demonstrated that we can put the heart back into business. Art allows us to see the small mundane details of life in the proper perspective, and by doing that, it makes us see that we matter. Love is a conversation. Gianandrea -- I find that hard data is the basis of all the conversations I have in the business world... yet the finer points, the sensibility, are the ingredients of engagement and connection. Which brings me to Joe's point. Joe -- interestingly the data is also what we choose to capture. Not all the data we track can help us 'see' so we can feel, so we can act. Sometimes we measure for the sake of proving that something is not working, because we don't believe in it. The science of business is data. Data isn't good or bad, right or wrong: it just 'is'. As in, "it is what it is." The art in business is how we use, interpret, understand, apply the data. Data comes alive via engagement, emotion, etc. Gianandrea makes a wonderful point in comparing contemporary art. Art exists on emotion - and what emotions the art draws from us. If our reaction to the painting, the sculpture, the poem, the analyses, the Powerpoint, the strategy - is ambilalence, then the "artist" missed the point. Good art evokes an emotion. Great art engages the artist's audience with the intended emotion. valeria, i'va always been convinced that science only cannot run a business in the evolving world. as you state in your post, you cannot build engagement and conversation without emotion and sensibility. and you a absolutely right when say: We should not try to read too much into it, I learned. It is easier to listen, to feel, and to understand. this is true for all the modern and contemporary art: poetry, music, painting, sculpture.